I would think Tennessee would on the list of the best roads because they spend alot of money a year working on them. (CNN) -- Before you take a road trip this summer, check out which routes could make your journey a smooth one and which ones have the potential for trouble. Kansas, Wisconsin and Montana have the best roads in the country, according to a list compiled by Reader's Digest. I wish they would've broken it down further into the deadliest stretches of highway. My wife just came back from defensive driving class last night and they said I-35 between San Antonio and Austin is one of the worst in the country. "Pennsylvania roads 'in general'". Amen. And I swear they have been working on the Turnpike since I was a kid. I'm now 30 and the Turnpike is still horrible. That's because they've been reconstructing the Turnpike generally from west to east. Most of the highway between the Ohio state line and the Allegheny Mountain Tunnel either has been, or is being, reconstructed. (The process began about 10 years ago.) They're pulling the whole highway out of the ground, doubling the depth of the road bed, widening the highway from four lanes to six in some places, and creating more of a buffer between the inner lanes and the median barrier -- and they're doing it piece by piece. By the way, Georgia has been widening I-75 for almost 20 years now, and they still have 24 miles left that are still four lanes. Nobody ******* about that, though. I drove acrost Pa this summer when I was driving home from the east coast, and they are right about those roads. Construction everywhere, bad roads and that turnpike is a joke. The turnpike rest centers were dirty, expensive food. I live out in Michigan and we dont pay anything to drive on our bad roads. I cant believe they charge you to drive down that road. They should have paid me for HAVING to drive on it. Oh, bitching is that what I was doing? Now now lets not ***** about road construction. Even though the roads are like an obstacle course with the amount of pot holes and you have to pray for your tires every time you go out. BTW, did you know Georgia has been widening 1-75 for 20 years and nobody there complains...I mean ******* about it? Yup, lots of Pedros and Marias learn how to drive their first car on that stretch of Interstate + it's just too many freaking cars for the road' capacity. It feels like 90% of Texas lives along I-35 between Dallas and San Anton, a few extra lanes are badly needed. It's surprising but just 2 lane interstate I-10 between San Antonio and Houston is more than adequate for the amount of traffic. Tennessee roads (and interstates) are on the steady downfall course. Your sentence might have been correct something like 5-10 years ago. At the very least, exaggerating. The Pennsylvania Turnpike has markedly improved west of the Allegheny Mountain Tunnel. MM 0 - MM 10: Reconstructed from the ground up; finished in 2009. 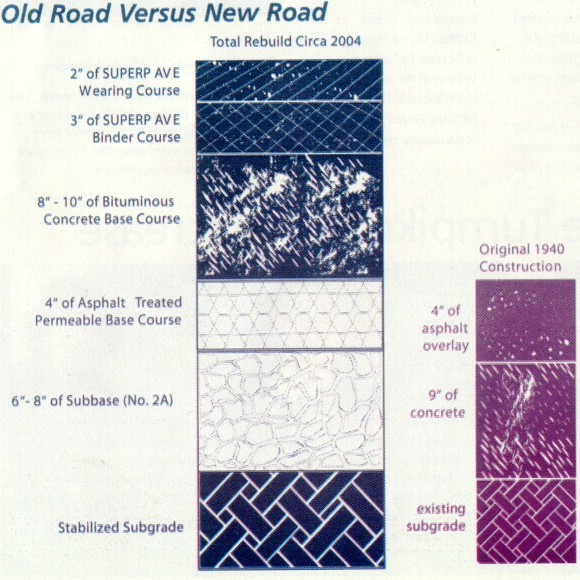 MM 10 - MM 28: Not yet reconstructed; no plans to do so prior to 2012. MM 28 - MM 31: Reconstructed from the ground up; finished in 2004. MM 31 - MM 38: Currently undergoing reconstruction from the ground up; to be finished in 2012. MM 38 - MM 41: Reconstructed from the ground up; finished in 2005. MM 41 - MM 48: Reconstruction from the ground up to begin in 2011. Allegheny River Bridge(s): Brand-new bridges currently under construction; to be finished in 2010. MM 49 - MM 57: Not yet reconstructed; no plans to do so prior to 2012. MM 57 - MM 67: Reconstruction from the ground up to begin in 2012. MM 67 - MM 75: Currently undergoing reconstruction from the ground up; to be finished in 2011. MM 75 - MM 85: Reconstructed from the ground up; finished in 2001. MM 85 - MM 94: Reconstructed from the ground up; finished in 2004. MM 94 - MM 99: Reconstructed from the ground up; finished in 2000. MM 99 - MM 109: Not yet reconstructed; no plans to do so prior to 2012. MM 109 - MM 122: Reconstructed from the ground up; finished in 2004. MM 123 - MM 129: Reconstructed from the ground up; finished in 2009. Of the 129 miles of Turnpike in western Pennsylvania, 93 miles of it has either been reconstructed already, or are in the process of being reconstructed. That's 72.1% of the Turnpike in western Pennsylvania. Other segments between the Tuscarora Tunnel (MM 187) and Harrisburg (MM 247) either have been, or are in the process of being, reconstructed as well. MM 187 to MM 197 is completed, and MM 199 to MM 226 is being completed in segments as we speak. With a road bed that's twice as thick, it should last a lot longer. Even though the roads are like an obstacle course with the amount of pot holes and you have to pray for your tires every time you go out. The spouse had to get new struts on his three-year-old car after hitting a series of particularly bad potholes. I've had to buy two new tires this winter after doing the same. I wonder if I can send the invoice to PennDOT?